I used the Chip Art tool to create the stamped images in the chipboard after I had colored it using a Krylon Silver Leaf marker! I then applied a coat of spray acrylic paint to it and finished it off by adding a little bit of bling! This was seriously, super simple to create! It only took me about 10 minutes + drying time! GCD Studios has 10 fabulous prizes to give away! You need to leave a comment on all of the blogs along the entire blog hop for your chance to win. So, if you have gotten this far and you have not left any comments and you want to win, well... you need to back it up and start leaving some love! From all of the comments, we will then select 10 random comments from 10 different blogs as the winners. The winners will be announced on the GCD Studios blog. Next, I wanted to THANK YOU for stopping by my blog today so I am having my own little give away! 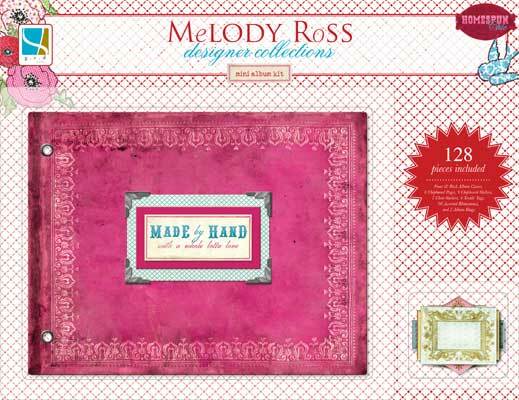 I will be giving away this Homespun Chic Chipboard Mini Album Kit along with a few other scrappy goodies that I am sure will put a smile on your face! I will randomly select the winner from all of you who leave a comment on my blog between now and 12:00 AM (Midnight) CST on Tuesday September 7. I will announce the winner of my give away on Wednesday!!! So now off you go to your next stop...Megan Klauer! Krylon makes markers? I am getting do many tips from this blog hop. I love chrome and silver and to be able to use something like this on chipboard will make for some super cool mini ornaments. Your necklace looks like it's all metal! So pretty and elegant - love the silver & bling - a girls gotta love some bling!!! 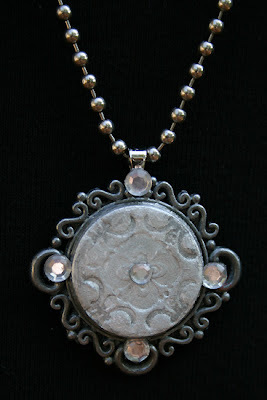 I love the way your stamping works with the scrolls on the piece itself - soooo many possibilities with this jewelry. Simple and fun. This is just so pretty - it'd make the perfect gift! this is so beautiful - love the way you've coloured with the silver and the bling adds the perfect touch! Your piece is simply STUNNING! Love the simple elegance, just gorgeous!!!!!!!!! Pretty necklace!! LOVE the bling!! ooohh...this is so elegant! I love the bling added to the pendant. Thank you for the chance to win your awesome candy...keeping my all my fingers and toes crossed ..very tightly..(lol). This is so lovely! very classy - great work! Very elegant necklace, love it! And the giveaway...very cool! Simply beautiful!! I love the added bling. Thanks for sharing!! Beautiful! Love that you added bling to the edge! I love the color, beautiful necklace! Really, really striking! Love the touch of bling, too! I love the pewter look to this piece. Your creativity is beautiful! 10 minutes?! Wow! I love the silvery leaf marker and the bling. Gorgeous work! That looks like something from another Century ... love it!! Gorgeous! Gorgeous! Gorgeous! Pretty! High 5 on a great necklace. Beautiful! I love the silver look of it!! Wow, 10 minutes! It probably would've taken me hours. Thanks! Love the necklace and the album. I have to try to make this necklace. This is soooo gorgeous...just love the feel of it! Love the idea of using the Krylon marker!! Thank-you for the inspiration!! cute! Love the bling on the edges. Beautiful necklace! Good idea with the bling.